An introduction to kaizen, the concept of continuous improvement, and first in a series of how to practically implement it within your service-industry organization. The concept of kaizen, or continuous improvement, has long been touted as the ultimate way forward in quality. Whether running a factory pumping out bicycle parts or a top-level consultancy firm advising clients on mergers, kaizen will help to ensure top product quality, and an ever-improving organization. Despite its qualities, leaders are often perplexed by what it really is. In essence, it encourages sincere pro-activism in order to stop small problems from building up and eventually crushing teams like a land slide. To follow kaizen is like walking up a heaven-like Stairway to Perfection: each step taken is one step closer to higher quality goods and services, reduced costs and satisfied customers. Kaizen itself can be seen to consist of three components. The first one actively encourages people to make mistakes, which to some, may sound counter-intuitive. Organizations too often punish errors, when we should actually be finding out why they happened, and find ways to prevent them from occurring again. The second component rewards people to find problems and fix them. It relies on the assumption that the people who do their jobs know their jobs best – a top manager may not truly understand the little techniques and tool that programmers use to detect bugs, or the tricks used to assemble a top-quality steering wheel. These people are the most knowledgeable about their jobs, so they are the ones who can find the best ways to make things better and more efficient. Finally, the third component asks people to be on the lookout on how to make anything better, such as work processes. It is the ultimate form of pro-active empowerment. Like many quality management tools, kaizen is not a quick fix for the woes of a company. Because it focuses on gradual improvement, fully quantifiable improvements may not be significant in the short term, but the positive effects will slowly, but steadily snowball into long term profits, quality and other non-monetary benefits, such as associate retention. Kaizen may be a brilliant idea, but implementation has eluded even some of the most talented leaders. Although the continuous improvement goal is clear, the road to doing it is murky, like a thick fog marring visibility navigating a narrow, mountainous road in an SUV, without the benefit of headlights or a GPS system. At Toyota, there are four basic tools which make up The Toyota Way, and allows Kaizen to happen: PDCA, Horenso, 5-whys and Mieruka (visual control). 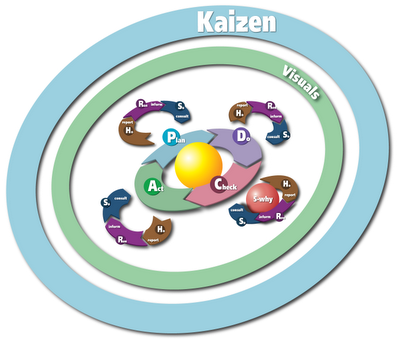 These put together allows kaizen to shed its abstract qualities, and become a powerful tool grounded in fact and reality. The diagram above shows the relationship between these tools and where they are used. In the next few sessions, each tool will be explained in detail with relevant examples, case studies and diagrams to help leaders make kaizen a reality in their own teams and business. Virtually all literature covering kaizen and its tools are biased towards the factory and manufacturing, because that’s where the concept originated. The focus here will be on kaizen in service industries, and the tools such as PDCA, are specifically adapted to this purpose. Whether you’re running a law firm, a consultancy group, a bank, a marketing company, a hotel, a hospital or even a travel agency, value can be added using kaizen. People find ways to make things better. Goods and services also improve over time. Leads to improved morale, better products, satisfied customers and reduced costs. Value can be added using kaizen in service industries. Applies to all non-manufacturing fields. Tools specifically adapted for this purpose.